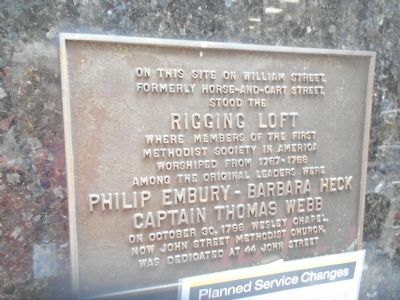 On this site on William Street formerly Horse-and-Cart Street stood The Rigging Loft where members of the first Methodist Society in America worshipped from 1767 - 1768. Among the original members were Philip Embury, Barbara Heck, Captain Thomas Heck. On October 30, 1768, Wesley Chapel, now John Street Methodist Church was dedicated at 44 John Street. Location. Marker has been reported missing. It was located near 40° 42.552′ N, 74° 0.398′ W. Marker was in New York, New York, in New York County. Touch for map. Marker was at or near this postal address: 130 William Street, New York NY 10038, United States of America. Touch for directions. More than just the marker is missing. (about 500 feet away); 33 Liberty Street (about 600 feet away); John Street (about 600 feet away). Touch for a list and map of all markers in New York. More about this marker. 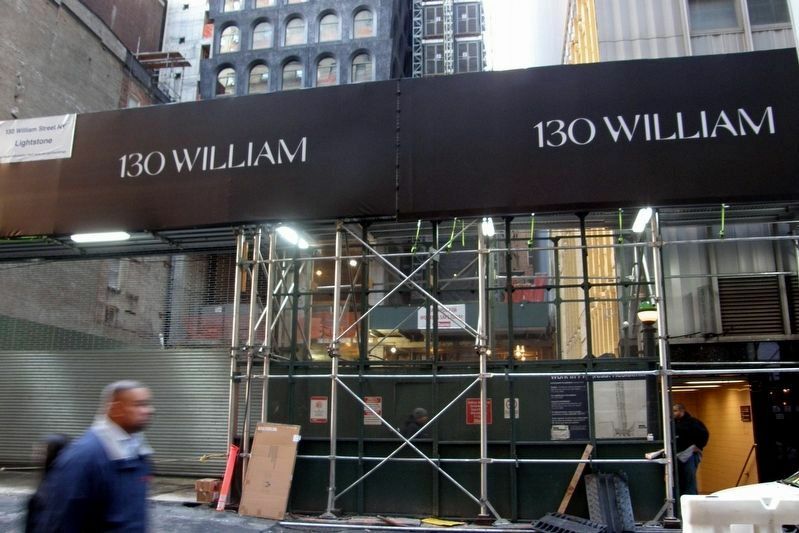 130 William Street has been demolished, with new construction underway. Maybe the marker will reappear when the building is completed? More. Search the internet for The Rigging Loft. Credits. This page was last revised on March 19, 2019. This page originally submitted on August 26, 2012, by Erik Lander of Brooklyn, New York. This page has been viewed 265 times since then and 10 times this year. Last updated on March 9, 2019, by Larry Gertner of New York, New York. Photos: 1. submitted on August 26, 2012, by Erik Lander of Brooklyn, New York. 2. submitted on March 9, 2019, by Larry Gertner of New York, New York. • Bill Pfingsten was the editor who published this page.